For a while I have been looking at this recipe that a friend shared with me, and finally I got down to preparing it. 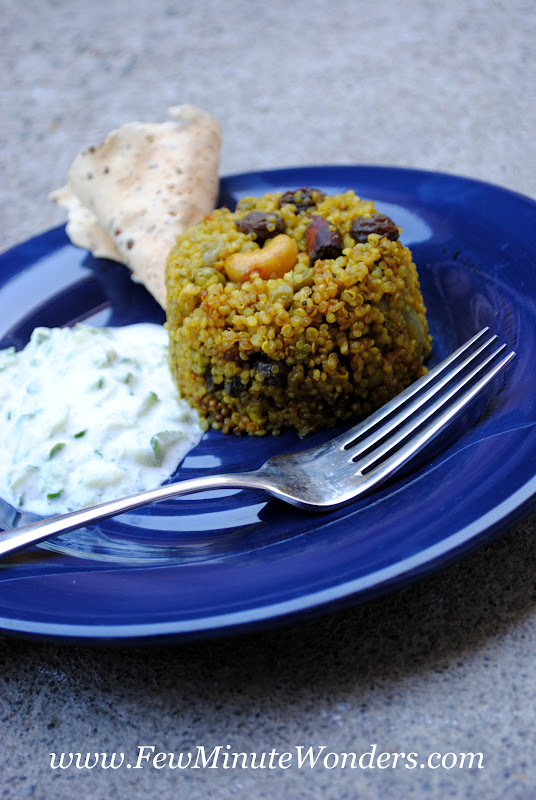 Prepare mint paste or sauce, store it in the freezer and use it when needed to make mint quinoa or rice. It adds so much of flavor and taste to the quinoa that it has become my favorite quinoa based dish to prepare. 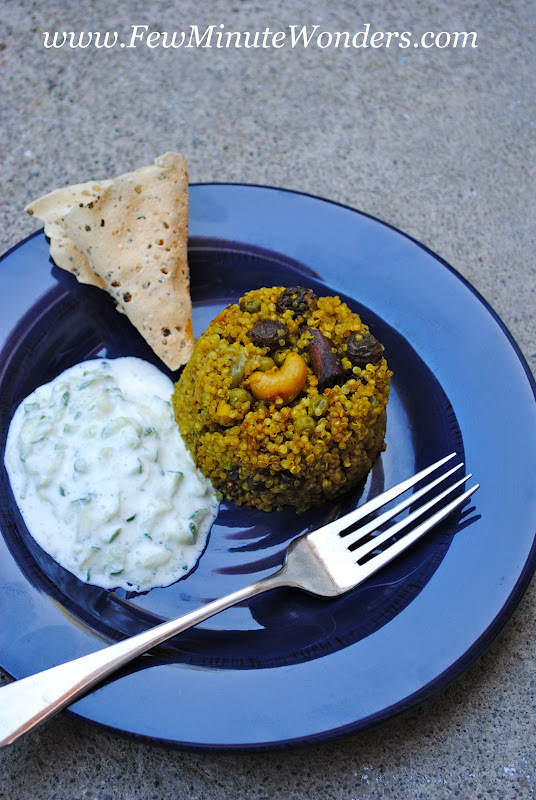 Last night for dinner, I made mint quinoa and served it on the side with cucumber raita. The breakthrough with this recipe is that my niece who does not enjoy quinoa as much liked it. If you cannot find quinoa, please substitute it with rice it is absolutely delicious. 1. Add all these ingredients to a blender and blend into a paste. Transfer to a freezer proof ziploc and store it flat or in ice cube tray. 1. Wash the quinoa and allow it to sit in water. 2. Heat the pan with oil and butter. Allow for the butter to melt and then add cumin seeds, cloves, cinnamon, bay leaves, cashew nuts and raisins. Allow for the cashews to lightly toast and the raisins to plump. 3. Add ginger, garlic and onions to the spices and cook them until the onions turn translucent. Add peas, chilli, turmeric powder and salt and cook for 2 minutes. 4. Drain the water from quinoa and add to the veggie mix. Mix the quinoa well for 2 minutes. 5. Add water and milk and check to see if there is enough salt. Then add the mint paste and mix well. Add the whole chilli. 6. Bring the liquid to a boil cover and cook for 15 minutes on medium heat. 7. There will be some amount of liquid left. Leave the pan half closed and allow the quinoa to cook through. 8. 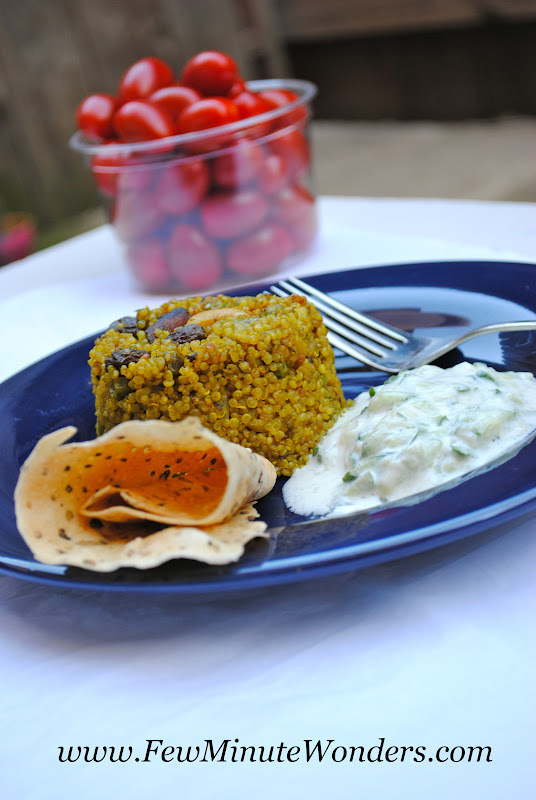 Once the liquid is evaporated the quinoa might appear sticky, but in 5 minutes it will absorb the water and will be fine to enjoy it with cucumber raita. sounds really good.. i really love the different varieties you prepare with quinoa.. i have been wanting to try it but dono why i have been pushing it away.. this is very tempting ! Good one.I want to try Quinoa, its been sitting in my counter for a while. Will start with this recipe. Mint quinoa looks delicious. I love to try them. Amazing pictures. I don't know how you can make a frozen mint sauce look that good. I love quinoa and try to squeeze that wonderful grain in any dish possible. Love the color the mint sauce gives to the quinoa. First time here, and lovely to meet you. I'm hosting the WTML event this month, if interested link up your entry. 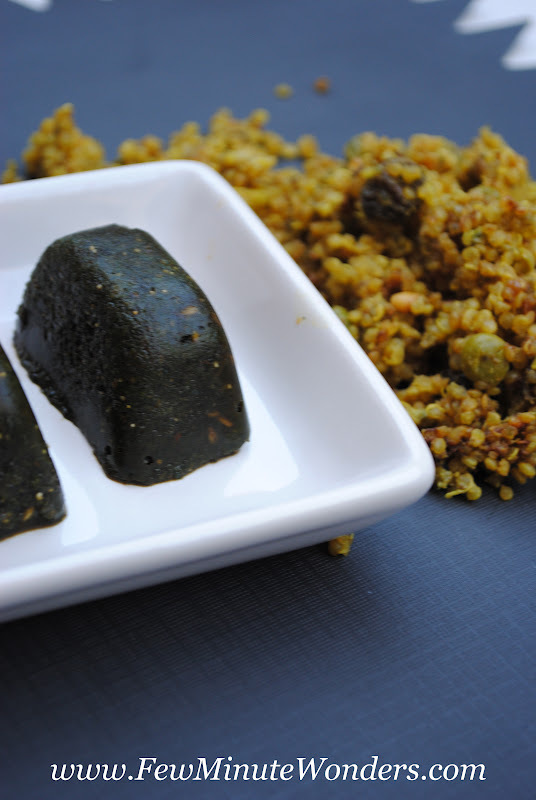 Definitely a super flavourful quinoa,freezing mint sauce sounds super handy and brilliant. Very healthy and I like the idea of the frozen mint chutney.. Thanks for sharing. We get mint only in summer and this will be a fine way to store them and use around the year.. Yes that is a great thing to do, I store chillies and ginger in the freezer. very flavroful n healthy preparation...freezing the mint sauce, nice idea n makes work easy n handy! 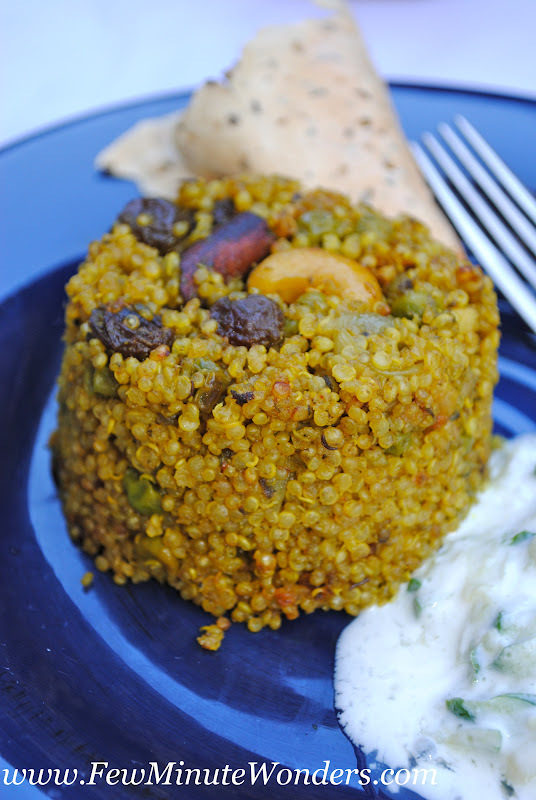 I am totally loving this mint quinoa pilaf! so earthy and nutritious! lovely clicks too! thanks for the sweet comments on my blog! Mint Quinoa looks fantastic. I also make it, but in a slightly different way. Love love your clicks. Made vegetable biryani last night using the frozen mint prepared as mentioned above. it was so easy to make. 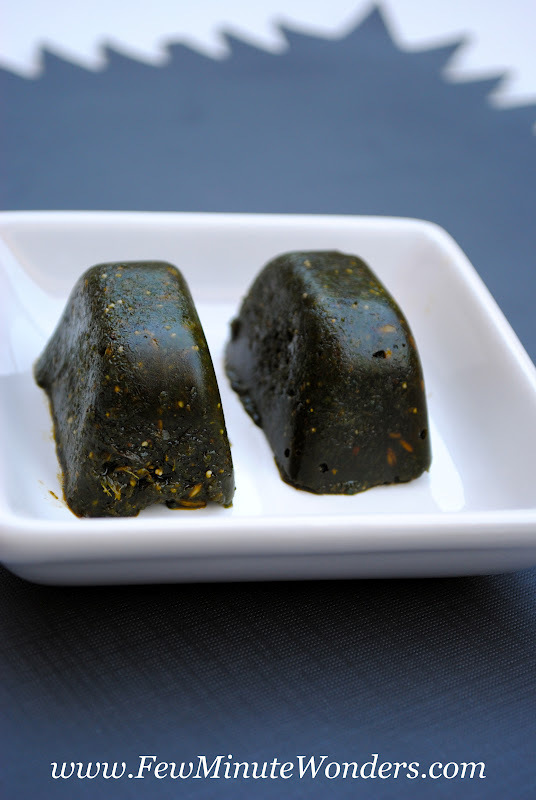 I had made frozen mint without adding any ingredients in case I wanted to use it for something else.